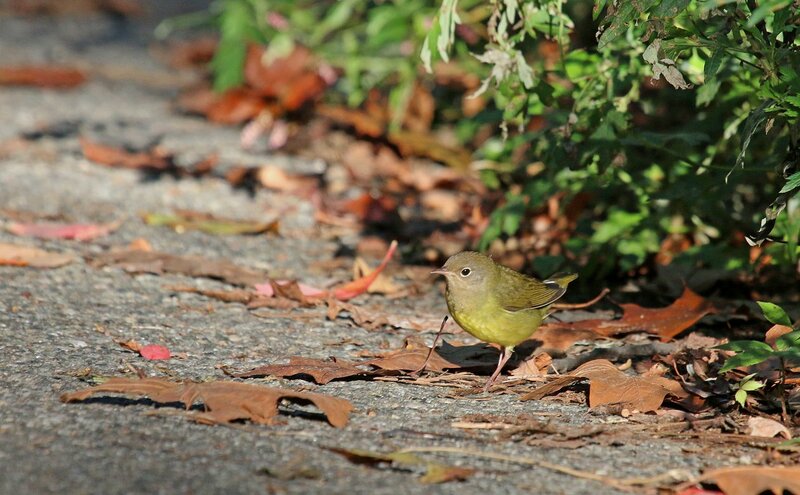 Danny let us know about a bird he had earlier that he was convinced was a Connecticut Warbler, something I teased him about because he has never seen one and it was fun to tell him that he actually had a Nashville Warbler, of which there were at least two in the park. We were having a grand old time, seeing Magnolia Warbler, Black-throated Blue Warbler, Ruby-crowned Kinglets, Blue-headed Vireo, and a bunch of other birds. As tends to happen when several birders are looking at a variety of birds we got split up. I eventually headed back up the hill towards the road where I saw Andrew crouched down like a commando peering intently into the brush. He had something good and I slowly and carefully made my way to his vantage point where he let me know that he had just had a Connecticut Warbler and was hoping it was going to come back to the same spot. Of course, I started letting him have the Nashville Warbler treatment, especially when, moments later, a Nashville Warbler popped up right where Andrew claimed he had the Connecticut Warbler. But Andrew stayed steadfast and, knowing Andrew, it was highly unlikely that he was going to confuse the two eye-ringed species. So I waited with him and, sure enough, out of the thick brush walked a Connecticut Warbler. We even managed to get Danny on the bird, which was as cooperative as a Connecticut Warbler can ever be. 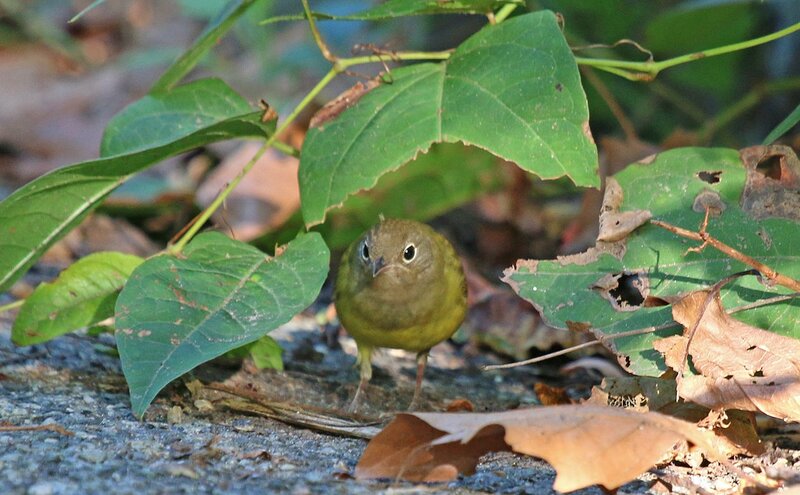 Considering that the image at the top of the post is what would usually be called a “good” look at a Connecticut Warbler this look was astounding. For whatever reason this skulky species sometimes spawns an individual who refuses to conform to the norm of driving birders nuts with lousy looks. See, for example, this post from 2008 when a bird in Central Park delighted birders or this post, from earlier this week, which casually mentions one that I found wandering in the grass at Madison Square Park. Why? Why would a bird that normally gives only partial views of itself as it navigates through thick plant life sometimes be willing to be out in the open? 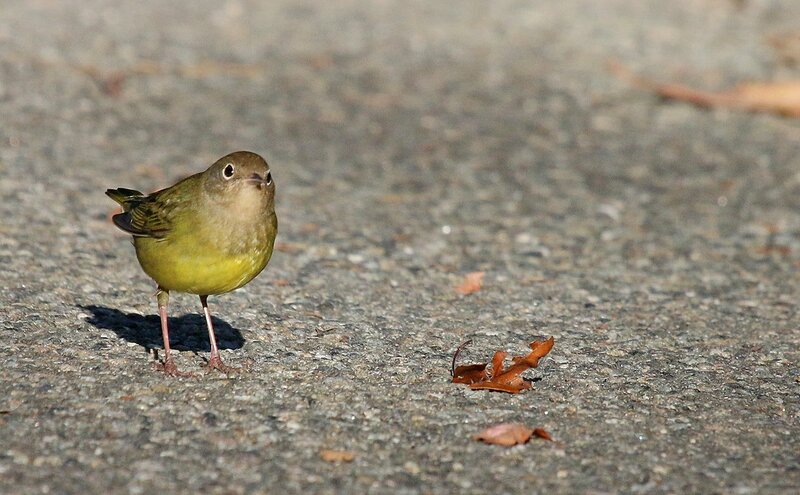 It’s almost understandable when such a bird is in a tiny park like Madison Square Park, where in order to get enough space to forage birds are essentially forced to go onto the lawn. But this bird at Strack Pond had plenty of room to move and yet it walked out onto the paved path right in front of Andrew and me! Here it comes! Right out onto the path! 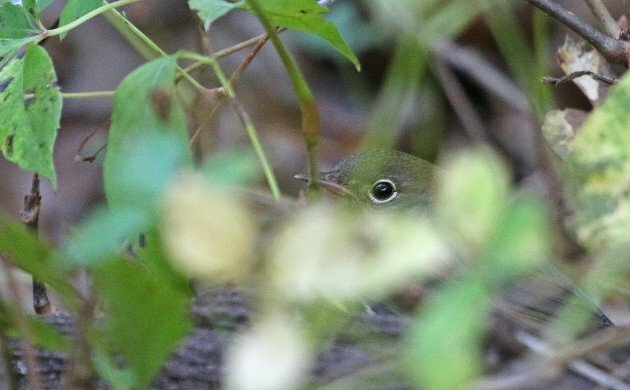 This is just an absurd situation for a Connecticut Warbler to be in. 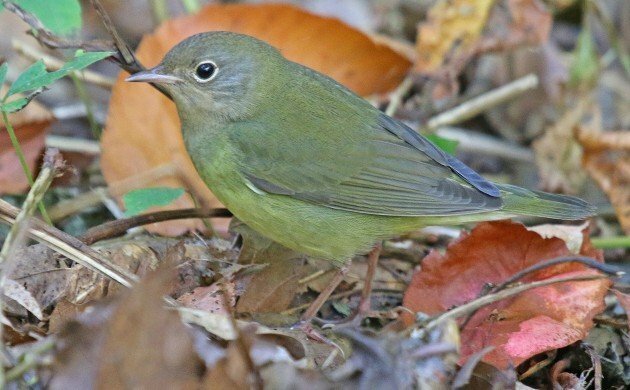 Even better, a bunch of other birders showed up and each and every one of them was treated to the Connecticut Warbler show. It was pretty awesome that so many people got this bird as their lifer. What’s next? A Band-rumped Storm-Petrel giving up on the ocean and flying in to my bathtub? Good luck, little warbler! May your non-skulking ways not get you killed! The birds are throwing themselves at me lately! That is one heck of a friendly bird.